Today’s the day for another website launch. 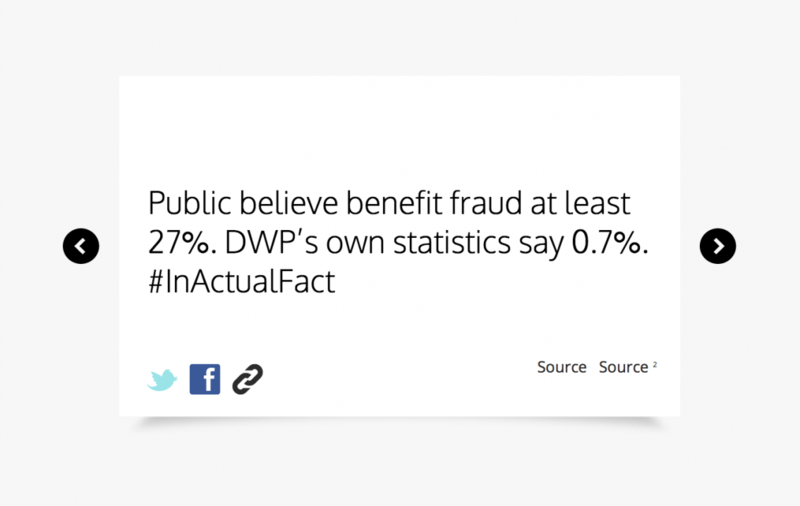 As Government and press propaganda about the cuts and benefit claimants continues to skew public opinion towards division and hatred¹ , we urgently need to answer back with the actual facts. But it is time for us to start shaping public opinion for ourselves, until governments and would-be-governments have no choice but to address the damage they are doing. And that’s where our new project, created with the invaluable help of CoQuo, comes in. Today, we launch In Actual Fact. In Actual Fact is a collection of actual facts that seek to combat the rhetoric of governments and the press. Each fact is short, memorable and instantly tweetable, providing bite-sized information for users to call on when answering back. All facts are carefully sourced and we invite you to submit additional facts for us to continue expanding the facility. This is a resource to use and build upon – intuitive one-click activism that is engaging, widely accessible and with the potential to make an impact. Tweet occasionally, tweet daily or tweet multiple times each day. Make In Actual Fact your browser’s home page so that it reminds you. Tell everyone you know about the site and get them to tweet too. Let’s start spreading actual facts and skew public opinion back towards truth.